The purpose of this blog is to document my adventures in homebrewing, mainly so I can learn from my mistakes. I'm posting it online so others can learn from my mistakes too. (I make a lot of them). 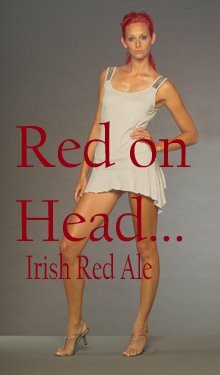 Now with comments on articles about beer and home brewing and the occasional beer review, as well as all of my home brew recipes. Señor Brew™ just recently brewed another split batch of what was supposed to be delicious frothy malty goodness, but he has to say, he is less than pleased with the results, at least most of the results. The idea was to brew a Maibock, one of Señor Brew™'s favorite malty styles of beer, and one that he has brewed quite well in the past. Some of you may recall that Señor Brew™ also likes to split his batches, for greater variety in the finished results. Variety is the spice of life. Señor Brew™ also used a new technique on this batch, called BIAB, short for Big Illiterate A**hole Brews. It can also be short for Brew In A Bag. Señor Brew™ plans another post about this technique in the future, at which time he will travel back in time to the time that he commissioned this post, to include a link to that future post. Confusing? See Back to the Future 2, and tell me why Marty McFly's girlfriend changed appearances from movie 1 to 2. And as long as we're time travelling here, also tell me why Marty's paternal great-great grandma Maggie looks so much like his mother? Again I digress. So, if any of you BrewBuds are still reading, I'll try to simply explain the brew, and what the problems were. Señor Brew™ put together a recipe that will also be posted separately, that is a little vague. The reason for the vagueness is that the good ol' boys of Enegren brewing, Bo and Luke, err, Chris and Matt (and Joe) gave Señor Brew™ some grain that they kind of flaked up on. No, it wasn't flaked grain, somehow they mixed up some pilsner and munich malt in the same bag. Since they are very exacting in their standards, without knowing the percentage mix, they decided they could not use it in one of their brews. So they donated it to Señor Brew™, who has no standards. I mean, he doesn't brew professionally, so it doesn't matter so much. Anyway, Señor Brew™ took the first runnings from the mash of this brew, which was the basis of the Maibock. 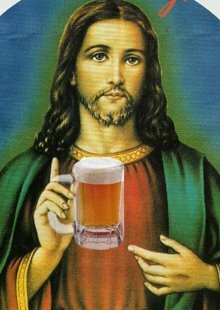 He then split the boiled wort into two batches, one to be fermented on ale yeast, wyeast 1968, and the second on lager yeast White Labs Oktoberfest. The second runnings were used to make a lower strength ale, we'll call it a Helles, but using the ale yeast. Are you still with me? The Helles turned out delicious. In fact it's gone. It only netted about 1.5 gallons of brew, which is basically 12 pints. After sharing it with his benefactors at Enegren, and sampling quite a bit himself, it is long gone. But there are plans to make more--in fact that could be NSB's new slogan--"drink all you want, we'll make more". The ale version of the Maibock probably fermented a little warm. While the Helles was fermented in two 1 gallon jugs that were easily stuck in the fridge when Señor Brew™ feared they were getting too warm, the ale Maibock was not. Señor Brew™ is tasting a little fuesel alcohol on the batch, which is a consequence of a warm ferment. It's not overpowering, but still noticeable--too "hot". It probably didn't help that the ale Maibock was of a higher original gravity than the ale Helles, 1.072 vs. 1.060, which led to a more vigorous, and warmer ferment. Also, probably not coincidentally, a more attenuated one--the 1.072 beer finished at 1.016 and the 1.060 at 1.015. 1. Possible underpitch of yeast--it was built up in two stages from an old sample Señor Brew™ had in the fridge for a long time. 2. Wrong yeast. Señor Brew™ was being thrifty cheap in using the Oktoberfest yeast, which is less attenuative to start with. The recipe he formulated on his brew software showed it would finish too sweet even fully attenuated. It also has a reputation of being a slow starter, and taking a long time to finish out. Señor Brew™'s best bocks have been brewed using Wyeast Bavarian. He had the Oktoberfest on hand, so he went with it. 3. Temperature control. The beer was fermented in the kegerator, which was sitting outside on the patio. Ideal temperature for this yeast is mid 50s, but there were a number of nights right at the beginning of the fermentation when temperatures went into the mid 40s. Señor Brew™ ended up putting a light bulb in the kegerator at night and switching the temp controller to heat to keep the ferment in the mid 50s. 4. Impatience. Señor Brew™ hoped to have this beer ready for the California State Fair competition, so he kegged it after a 14 day ferment with a 2 day diacetyl rest. This would allow for a 8 week lagering period before the judging date. 5. Incompetence. Señor Brew™ did not take a gravity reading before he kegged the beer, assuming with the diacetyl rest in the upper 60s that it had finished out. Bzzt...wrong. As mentioned above, it's now sitting at 1.034 gravity, off it's yeast cake. In his defense, there was a poor seal in the carboy cover, so no airlock activity ever occurred. If Señor Brew™ had seen it still bubbling away on day 12, he probably would have waited longer to keg. There is a fix for this however, which Señor Brew™ is working on right now. I think this post is already too long, so I will save that for the next post. YAY! Finally, we need suggestions for Noble Square Brewery's slogan. Winning entry wins homebrew! 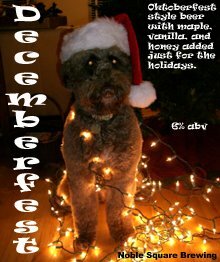 Decemberfest label featuring Bosworth the wonder dog. I used this photo as part of my Christmas lager label. 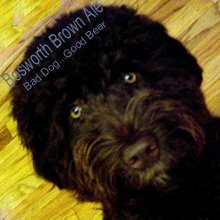 The label from my American brown ale. Señor Brew™ likes beer. More to follow.